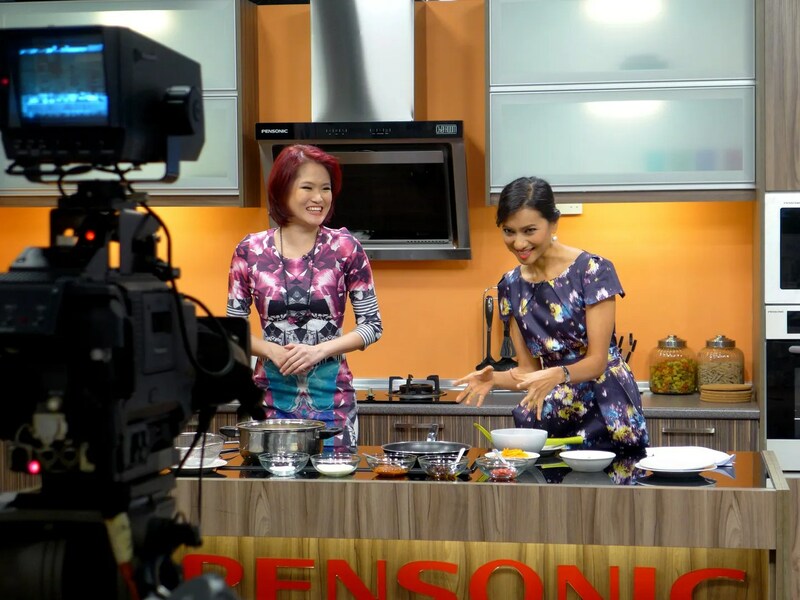 Just a year ago, I was invited to be on Bella Unwind NTV7 (read about it here), and it was a nerve wrecking, yet memorable experience as it was my first live TV filming experience. Fast forward a year, I’ve had a few more TV appearances, but still pretty much a newbie when it comes to talking into a giant video camera. 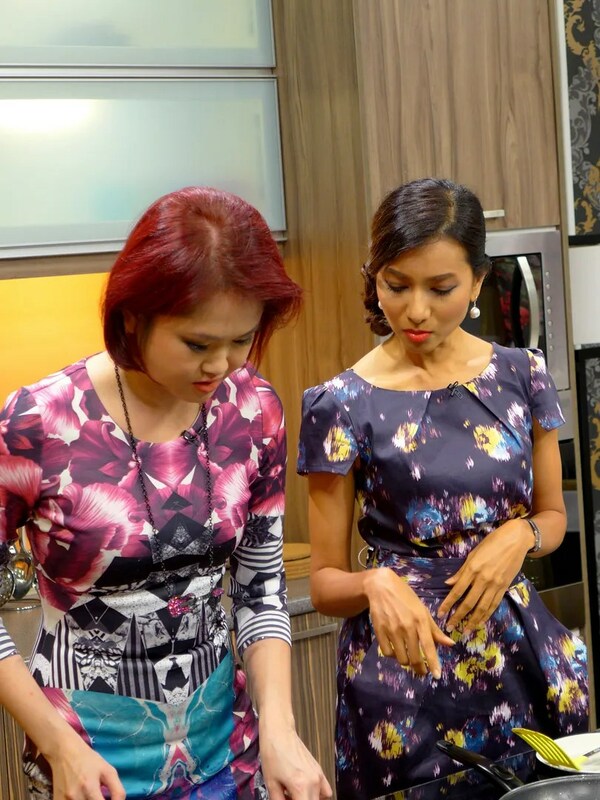 Well, just a couple of weeks ago, I received yet another invitation from Bella Unwind to appear on their show, this time I was invited to demo a pasta dish with a local twist. Of course, I’m never one to turn these things down, even though it would mean I give up a little bit of sleep to be at the studio (going through a particularly bad period of insomnia at the moment). 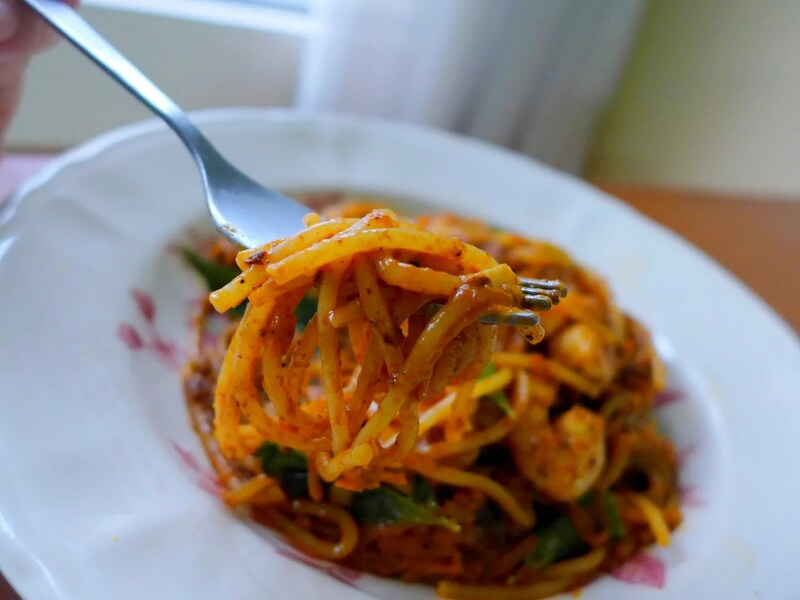 I experimented with a few pasta dishes and finally decided on a laksa inspired version with prawns. The day came and as expected, I had almost zero sleep that night (brilliant). We made our way to Shah Alam Studio and it all seemed like I was there not too long ago. After prepping the ingredients and some touch up by the make-up artist, we were ready to film! The host of the day was Lisa Wong, whom I had the pleasure to meet several years ago when I just moved to KL, so I was a little less nervous. Though being live TV, my tongue did react a little slower, hah. We talked a bit about the different types of pastas and cooking tips, and I went on to demonstrate the dish. Oh yeah, I’m getting the hang off dyeing my own hair, this shade was supposed to be a deeper purple, but because of my bright red hair, it’s gone a little maroon-ish. My dress is from Zalora, by the way. Trying to stay graceful while cooking isn’t an easy task, I tell you. I didn’t get a picture of the dish I cooked though, but will share a recipe of the version I did at home. The plate they had at the set was so small, so my plating was a little messy. Oops! The taste was good though, judging by the crowd’s reaction. My mind was completely blank by the time we finished the interview, phew! Hoping for more opportunities like this so I can practise more. 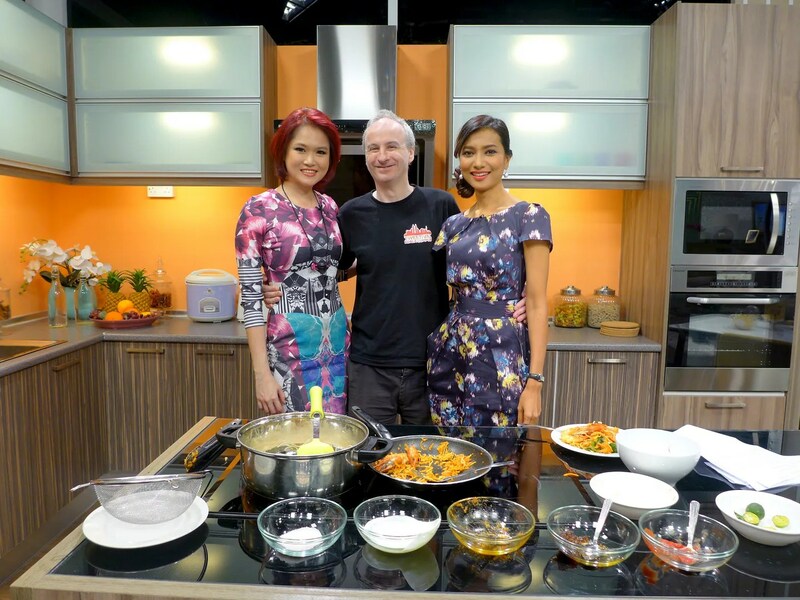 Thank you Bella NTV7 for the invitation! 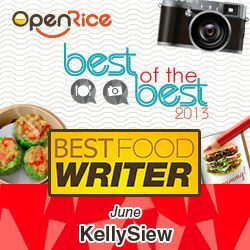 Naturally, I used a Sarawak laksa paste to make this at home, but during filming I had gone with a Nyonya laksa paste (I ran out already, uh oh!). 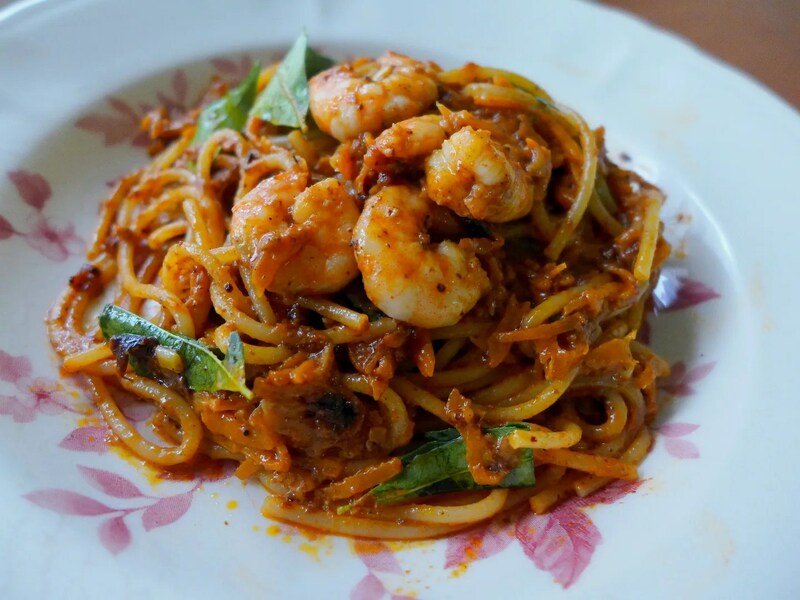 I added spiralised (will do a post on my spiral cutter soon) butternut squash and curry leaves along with the prawns. The combination works fabulously, and it’s really quick to put together too. Cook Spaghetti to packet’s direction in salted water. Generally about 10 minutes, but I suggest under cooking for a minute as you will need to cook it again in the pan. Fry the curry leaves in a bit of oil until crispy, and set aside until needed. Meanwhile, saute garlic and butternut squash until soft, then add laksa paste, tomato paste and mix around for a couple of minutes. When it’s aromatic, add cream, followed by the prawns (alternatively, cook prawns separately and then combine with the sauce). Once the sauce achieves a nice thick consistency, add the spaghetti and curry leaves and finally the sambal belacan and toss to coat. And you are done! Squeeze the lime over just before serving. This takes less than 15 minutes to prepare and so delicious! Get into my mouth already. I love the richness of the sauce, while the squash/pumpkin lends a subtle sweetness, and the zesty lime kick is ever so aromatic. The aroma of the curry leaves is rather addictive too. Next time I crave for laska I might give this a whirl again. Have you tried any fusion pasta before? If so what is your favourite combination? Oooo…that looks stunning!!! Just like the one cooking. Wink! Wink! Gotta try this sometime.